One of Taylor’s sculptural works directly references the crucifix. Hung from a solid vertical, creating the horizontal part of the cross in this work, is a large sheet of brown paper that has a wood grain texture. On the paper is a screen-print of the source image, partly in gold like an illuminated manuscript or the framing for religious paintings and triptychs, which highlights this texture by the way the ink only applied to the outer level. Where the vertical component is finished (with paint) this work takes the form of a giant match, burnt most of the way down until it was extinguished, which could make this piece refer to being burnt at the stake. Meanwhile the work also resembles an abstract human figure, Christ probably, like a mixture between Alberto Giacometti and Constantin Brancusi sculptures. The head of the match or figure is pierced in the violent manner of a Lucio Fontana painting such as The End of God (1963), more violent than the process in Scott’s work, whilst also perhaps referencing some plant seed heads as depicted by Georgia O’Keeffe, symbolising rebirth. Also of interest in this exhibition is the central installation through which we must walk to see the three rooms of the exhibition, which has apparently pierced through from the gallery space to what were previously artists’ studios. Constructed as a huge packing crate, the work relates religion to art through it taking on the cruciform layout of church buildings, whilst artworks are regularly shipped around the world or stored in such crates. This transportation of art could be related to the gospel spreading of Christianity, suggesting Art to be a religion. 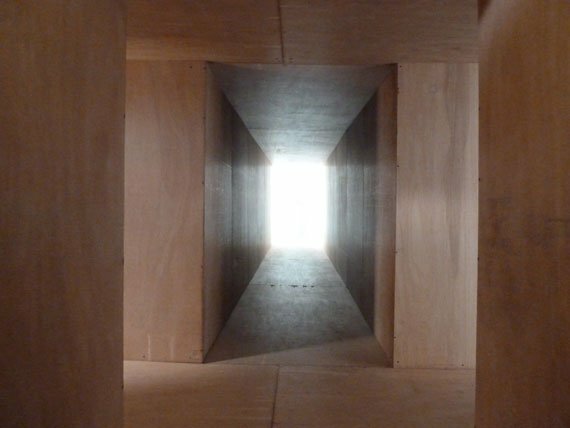 This piece also seems to reference Monika Sosnowska’s Untitled (2004) labyrinthine installation at the Serpentine Gallery in its interception of space with a fresh timber structure creating a new temporary environment. Stood inside the work, do the viewers become an artwork in transit themselves? It is interesting to experience the solitary life of an artwork in storage with nothing to see but your dark timber encasement, awaiting a potential opportunity to shine on stage in the future. A further small Styrofoam work is positioned on top of the crate, banging the nail into the coffin that the work is from the inside, closing the door that is casually propped up against a structural column of the building like a trap door about to close and entomb an unsuspecting viewer inside. 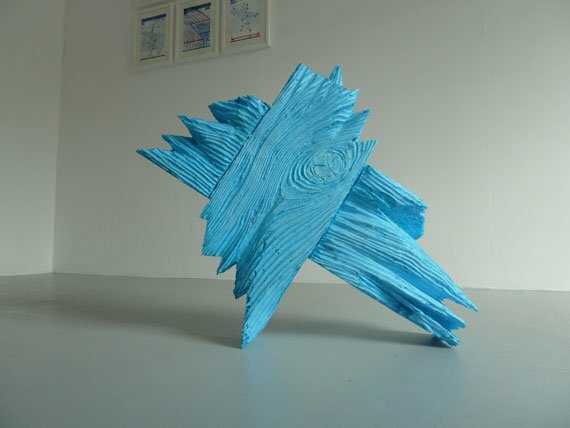 Like Taylor’s works in Styrofoam where the blue colour remains, Anna Brereton’s work in the Slade School show focuses entirely on textured surfaces. Her works are made in materials such as concrete and handmade paper, with the choice of material and tone seemingly at its own will, secondary to the work’s form. This results in a collection of naturalistic and constructorly greys. The surfaces themselves refer to a combination of natural materials, such as stone, the recording of language like Braille or that carved into tablets such as the Rosetta Stone, and to relief sculpture like that from the Parthenon, both of which are today in the nearby British Museum. 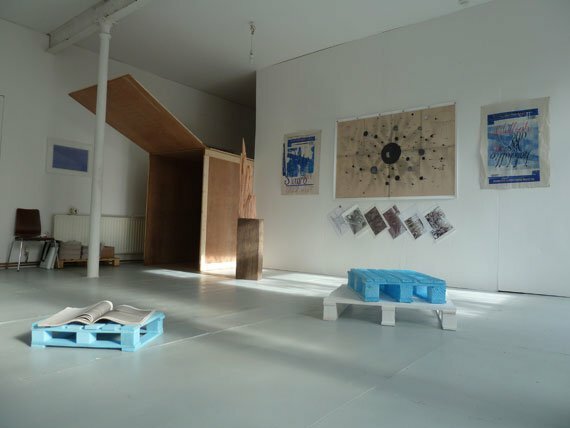 Neil Taylor, True Wood is at Campbell Works, 27 Belfast Road, N16 6UN until 19th June 2011. The Slade School of Fine Art BA Show is at UCL, Gower Street, WC1E 6BT until 2nd June.